I always try to optimise my fishing by using tactics that I think will give me the best chance of a decent sized fish or a good catch of fish. After the last of the 'maggot tides', when the fish were feeding on Coelopa larvae, I had to try something else. I looked at my list of possible things to do and the best bet seemed to be bait. Several factors were involved in the decision. Firstly, the recent wind had dropped with only the lightest offshore breeze forecast for the following morning - perfect for a free-lined bait. High water would be round about first light so I wouldn't have to be up too early to get an hour's fishing before the top of the tide. Lastly, the surfer's websites suggested that there would be little or no swell and so probably not much loose weed, a real bonus when you are freelining close in. The evening before I intended to fish I dug a mackerel fillet out of the freezer and popped it in the car boot; by the following morning it would have thawed nicely. I set the warm clothing by the front door ready for putting on (it's usually chilly early in the day). My rod was already set up but I cut off the trace and tied on a new one of 20lb clear Amnesia and replaced the 6/0 circle hook (I still haven't found a 'perfect', fine-wire hook for this type of fishing). The alarm was set for 05:00hr and we went to bed. The following morning there was no moon and it was pretty dark when I arrived at the coast. 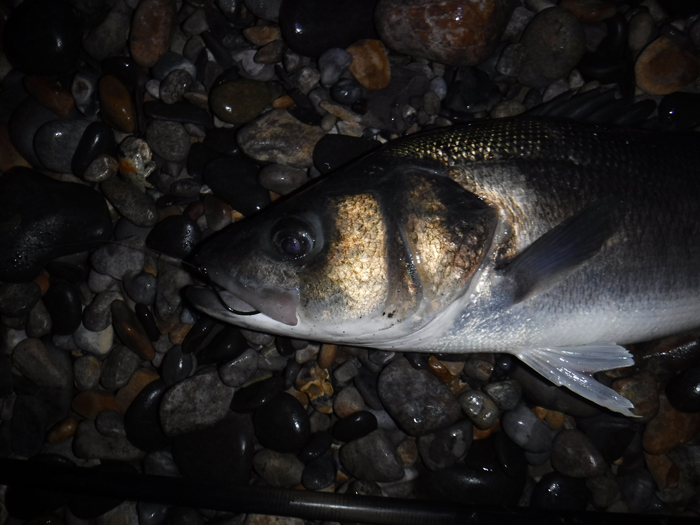 Using my headlamp I baited the hook with my flank of mackerel before closing the car boot and trudging down to the sea. I switched off the lamp long before reaching the water and carefully made my way to the spot I intended to fish. My bag was dumped well up the beach, away from the tide and slight swell, and I walked down to the waters edge before swinging the bait out into the darkness. I heard it splash-down perhaps a couple of rod lengths from where I stood and taking a pace backwards to avoid slack line I held the line gently in my left hand, bale arm still open, and waited. Five minutes passed and I felt a slight drag on the line. Clearly, although I couldn't see in the darkness, it had sagged down and picked up a bit of weed, so I reeled in and cleared the hook before lobbing the bait out once more. After another ten minutes the line had sagged again so I reeled in and made a third cast. I suppose I could avoid this problem by using a bit of lead but I'm used to freelining now and I'm prepared to waste a bit of time recasting to avoid the possibility of extra weight interfering with a bite and putting fish off. Ten more minutes and I was beginning to think I could have chosen the wrong place when the line twitched in my fingers. It's quite unmistakeable, that little tweak as a bass attacks and picks up the bait. Now my nerves were on edge and a second later the braid began to stream out through my fingers. I think that this is one of the most exciting moments in fishing. I had to make myself breathe as the running line accelerated. The fish had taken perhaps twenty metres when it slowed down, so I took the opportunity to gently close the bale arm. I felt the rod pull slowly round to the right and then as the tension increased the fish took off making the clutch of the reel screech as it ran. Although I could feel that the bass was very close to the beach on my right I could see nothing so I played the fish by touch as it ran and splashed on the surface. After a minute or two I'd retrieved most of the line and the fish was close so I walked towards it, took the trace in my hand and slid the bass ashore. Excellent! 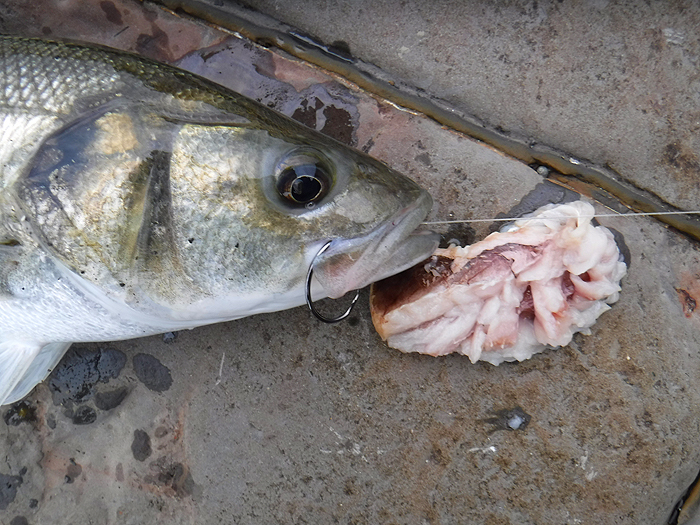 After taking a couple of pictures I easily removed the hook from behind the maxilla, measured the bass (66cm) and returned it to the sea where it swam off at once. Success! 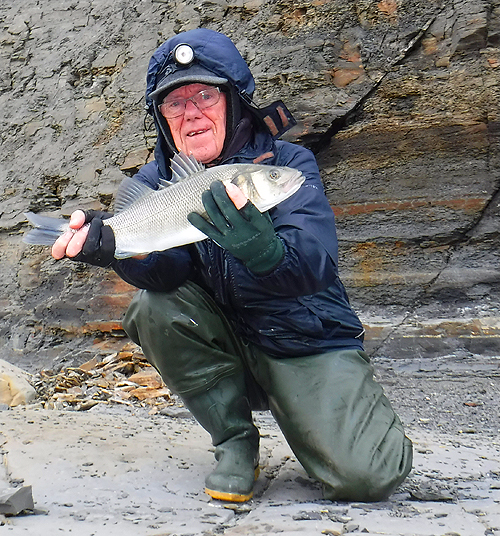 A few evenings later, as the tides were building again, my pals Nigel and Bill said they were going to have a try for surface feeding bass and mullet and I was keen to join them. We had no idea whether there were any weed middens on the beach so it was going to be pot luck. 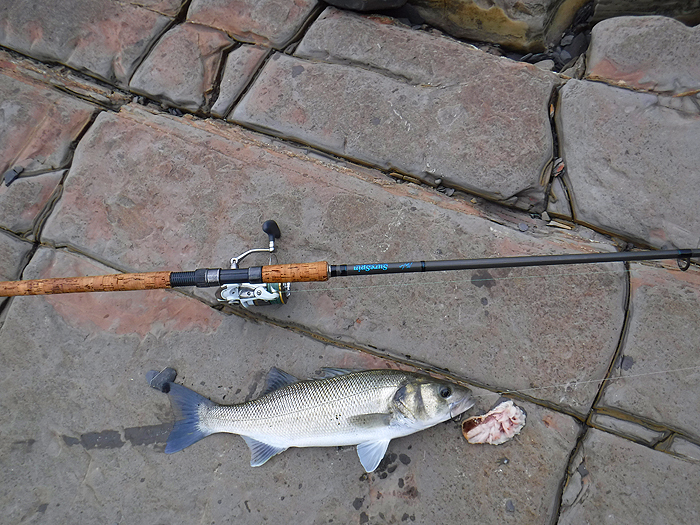 I decided to hedge my bets and took along not only a spinning rod and a fly rod but also my old Surespin rigged for freelining and a couple of mackerel fillets. When we got to the shore it was pretty rough with a stiff westerly wind and a big chop on the sea. There was no sign of surface feeding fish and the only maggoty weed was high on the shore beyond the reach of the incoming tide. My pals decided to spin their way along the shore in search of a bass but I opted to try the bait. I walked back a little way until I got to a flat ledge which was just awash with the rising tide. I stood on the ledge and flicked my mackerel fillet into the waves breaking over the ledge. It swung round quite quickly with the wave movement and every few minutes I reeled in, removed the odd bit of feathery weed from the hook and cast out for it to swing round again. It must have been the fifth or sixth cast and the bait had hardly hit the water when I felt the line twitch and it began to race off the spool as a bass carried off the bait. I let it run freely for a while then I swung the rod towards it to give a little slack line as I closed the bale arm. The braid drew tight, the clutch sang and I was in. What a battle. Several times the fish made long runs, possibly helped by the flow of water over the ledge, then it swam up against the flow and I had to steer it away from the rock edge. This one fought much harder than the fish that I'd had in the dark a few days earlier and I thought that it would be a good deal larger but when I slid it onto the rocks it proved to be only 54cm long and perhaps four and a bit pounds. Slightly disappointing but since it turned out that my pals hadn't had a sniff on their lures I felt well pleased with the catch. A good hours' fishing. .
A big, fat, seven pound bass taken on my freelined bait in the dark. Nicely hooked on my big circle hook. 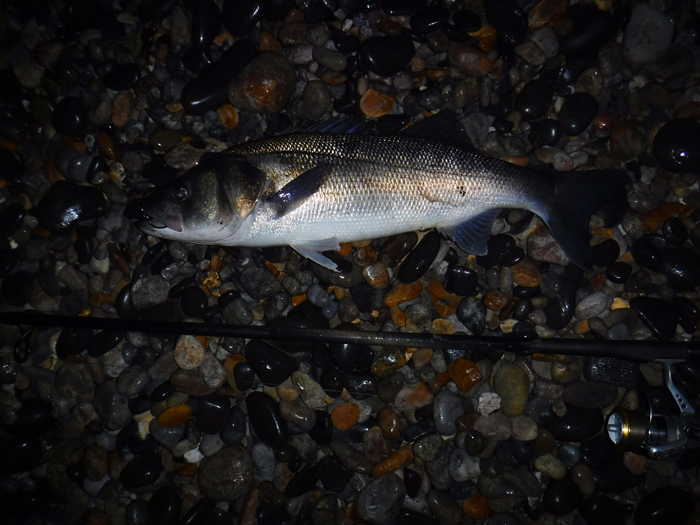 The smaller fish caught at short range in rough water, using my old Surespin rod. Again nicely hooked although the hook has slipped through. Note the large size of the bait. I managed a selfie before putting the fish back.